Ireland's baby boom continues apace, despite the economy. 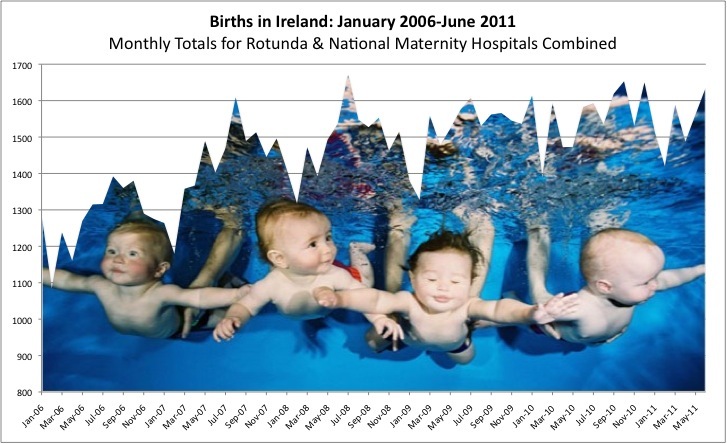 I've updated a previous analysis of births at Ireland's two leading maternity hospitals - responsible for nearly 1 in 4 births in the country. The data includes the first six months of this year. The good news is that the number of births continues to rise - albeit at a much slower rate (1-2% year on year on a smoothed average basis) than in the earlier part of the data series. It's one reason why we can continue to be positive about our country's medium to long term prospects - despite the short term gloom and uncertainty. Seasonality is still quite marked - February is a great month to have a baby if you want the undivided attention of the midwives (typically just 87% of the monthly average for the past five years). August is a somewhat busier (105% of the average!) as anyone visiting a maternity hospital at the moment will know. Including a colleague of mine since yesterday - congratulations Mark! Odd, Feb is the optimum month for teachers (maternity runs into summer hols), perhaps it is just the ones I know who have been clearly planning that one meticulously.